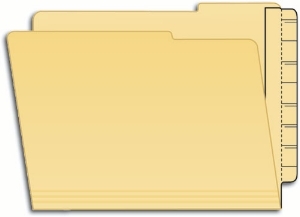 Tabbies extenda-folder strips convert drawer filesfile folders, file pockets, or expanding jacketsto shelf files. These convenient, self-adhesive strips save the trouble and expense of transferring materials and throwing away good file folders, pockets and jackets. tabbies extenda-folder strips are available 100 per box, in four styles for different uses. Stock No. 55993 is specifically made to convert pocket folders, pressboard folders, gusset pocket folders, or expanding file jackets from drawer to shelf by attaching a strip to the back of the pocket, pressboard folder, or jacket. tabbies extenda-jacket strip can also be pre-coded before affixing for quick file system conversions. Stock # 55995 is made 1/2" shorter than the 55993 product. 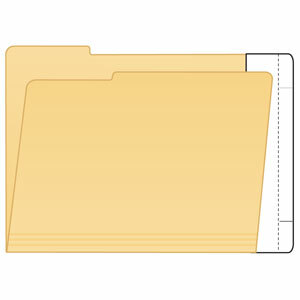 This allows the item to be used with 1/3rd cut drawer files where the tab cut is positioned away from the right edge of the folder. It can also be used where an undercut is required. To do this, simply line up the extenda-strip to the top of the existing file to leave a 1/2" undercut. Again, this item can be pre-coded before affixing the item to the file that is being converted.